With the arrival of conferences next week, I needed to get the children's Me Books up to par so we could share them with the parents. I always like to show the parents what the children have done during the course of the year. The weather this year had put me behind. It always seemed like we had a snow day on days I had planned to complete a new page. 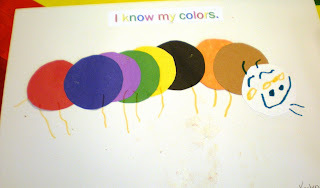 The "I Know My Colors" page is done with different colored circles. 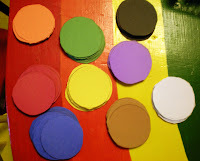 We go through the colors of the circles and then the children glue them down to make them look like a caterpillar. The caterpillar always reminds me of the one from "The Very Hungry Caterpillar." After all the circles are glued down, the children decorate the caterpillar with legs and antennae. 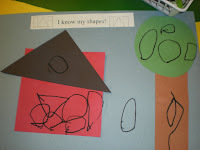 The "I Know My Shapes" page we do after we have all our fun with the shapes. I have pre-cut shapes, square, circle, triangle, and rectangle. 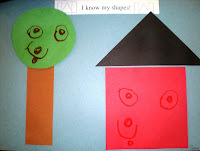 The children tell me the names of the shapes and then glue them down to make a house and tree. They then decorate the scene as they like. I also do a "Here is My Name" page. 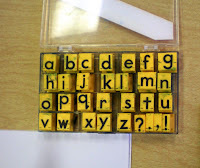 For this page I have the children stamp their name with our letter stampers. Then a few weeks later, we step it up a bit. 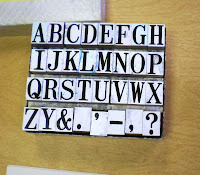 The children's names are printed out in dot form and they connect the dots to "write" their name. Before school ends I allow them to all try and write their name on their own. I always encourage them to try and write whatever they think it looks like. The final page we caught up on was the "I Can Cut" page. 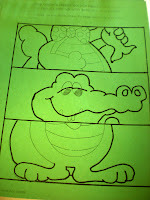 I give the children a picture of "Alley the Alligator" who is all mixed up. 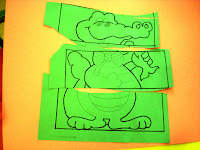 They have to cut the alligator apart and glue him back together in the correct order. I have to say I am very proud of how well they are all doing with their scissors. So, we are all caught up and I'm ready to go, I hope. I always get so nervous at conference time. I can talk to parents everyday, but put it in a formal situation and it's a whole different ball game. I love the caterpiller ideA! I am always looking for new ways to teach my 2 yr old colors! Where did you get the alligator page from? My g'son would love this. Many, many years ago I got a book with scissor practice pages in it. This page is actually from that book. I think the caterpillar is a good idea... You just gave me a fun way to teach my kids. My I make shapes on of this day too so that I can show my daughters how to make fun with shapes. Fun and learning at the same time I know they would love that.